Our second day in Chicago was much longer than our first. We decided to use Mass Transit today rather than park our car in town at an exorbitant rate and then fight traffic getting into and out of the city. Things worked out very well. We began our day at the Museum Campus on the lakefront. 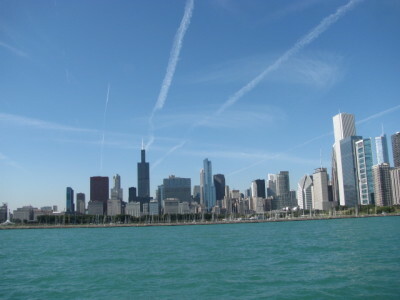 I wanted to take pictures of the Chicago skyline, one of the world’s most beautiful, from the tip of this spit of land that juts out into Lake Michigan. 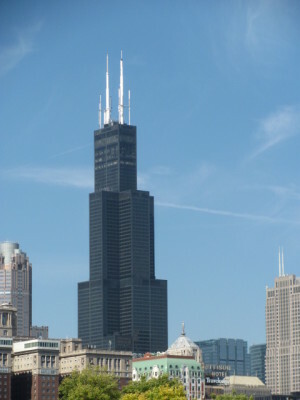 The Willis Tower, which was the Sears Tower when we visited in 1993, is particularly distinctive and photogenic. 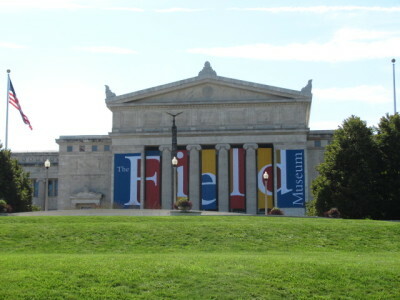 We of course, passed by the Field Museum of American History. 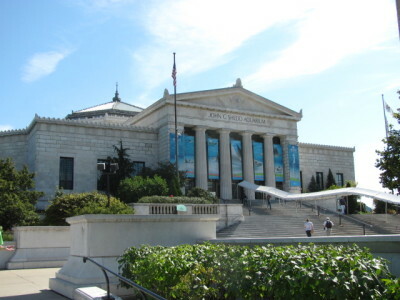 We also checked out the Shedd Aquarium, one of the oldest and best in the USA. 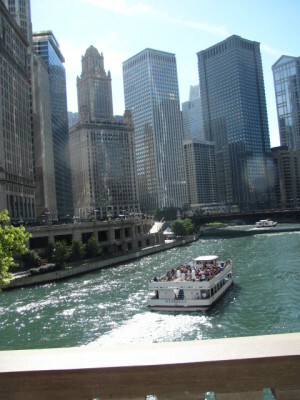 Next we decided to take the Water Taxi from the Museum Campus to the Navy Pier. 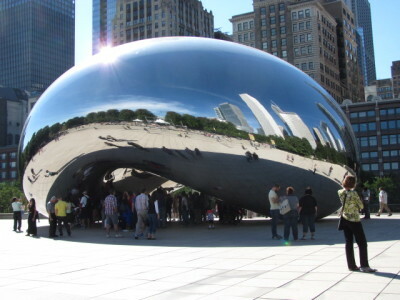 The $8 per person fee was certainly reasonable considering the dramatic views of the skyline and the saving of wear and tear on our feet and legs. 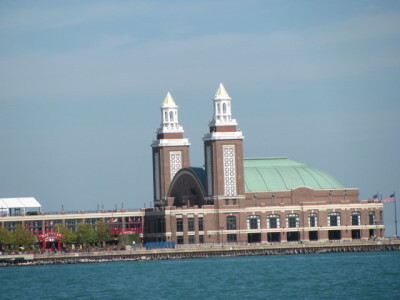 The views of the Navy Pier from the water were also spectacular. The inside of this kid’s paradise is extremely loud and distracting. We simply found bathrooms and moved on. 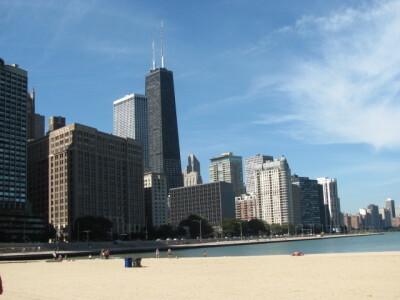 From here we walked to the Ohio Street Beach with its backdrop of skyscrapers. 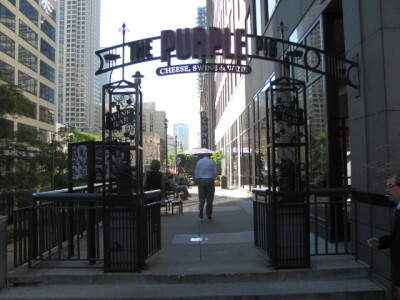 Now we headed west to begin our walk of the Magnificent Mile, the ultra-high-end section of Michigan Avenue, populated with expensive shopping venues. 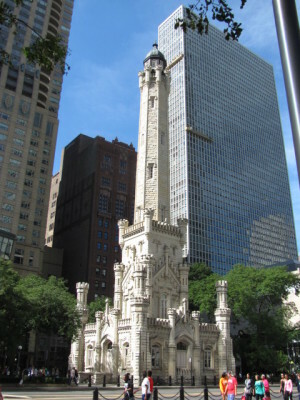 We began our walk down Michigan Ave at one of my favorite buildings in the whole world, the Chicago Water Tower. 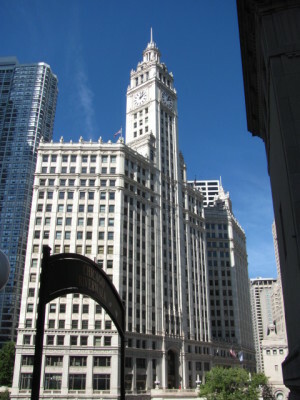 It is architecturally splendid and is one of only a few buildings in the city to survive the devastating fire of 1871. 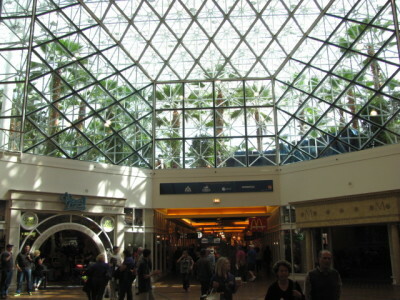 It is now the Tourist Information Center. 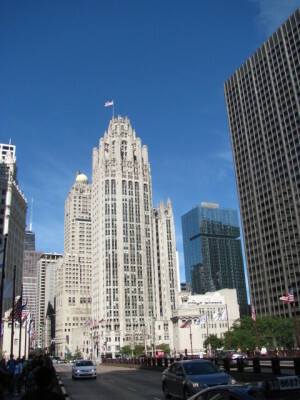 At the southern end of the Magnificent Mile is the Chicago Tribune Tower, a gorgeous building which includes pieces from many of the iconic structures around the world (such as, The Pyramids, Taj Mahal, The Alamo, The Great Wall of China, etc — pieces from over 120 different structures). On the other side of Michigan Ave from the Tribune Tower is the Wrigley Building (of chewing gum fame), another iconic Chicago landmark. Its tower was patterned after the Giralda of Seville, Spain. 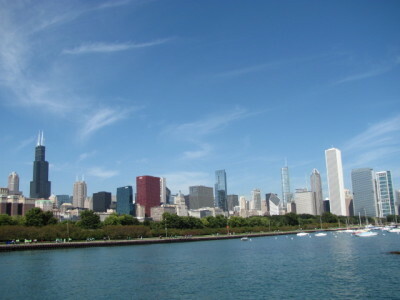 We then continued our walk across the Michigan Ave Bridge, into the section of the city known as “The Loop.” The bridge crosses the Chicago River which has been significantly cleaned up so that it has become a significant part of the tourist scene in Chicago. This restaurant is like no other! The menu is the most unusual we have ever seen. And everything we had was excellent. We began our dining extravaganza with Roasted Corn, embellished with rosemary, walnuts, and mushrooms — fantastic! Next we had Pork Neck Bone Rillette, a kind of delicious pate’ which was spread over Italian toast and then garnished with Mostarda, a sweet sauce made with figs and dates. We were then given an order of Pig’s Tails, braised with balsamic vinegar and served with Grated Egg and Parsley. Our next dish was Quail, stuffed with Trahana pasta and Porcini Mushrooms, garnished with Salsify and Pomagranate. For dessert we shared a Lemon Panna Cotta, with lemon marmalade and pistachios (to die for). What an unbelievably memorable meal!